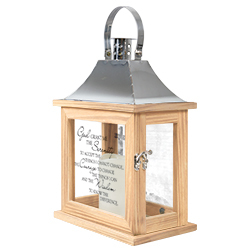 “Serenity Prayer” Memorial Lantern – Inscription reads, “God grant me the serenity to accept the things I cannot change, courage to change the things I can and the wisdom to know the difference.” ” Our Memorial Lanterns are made from quality composite wood and a stainless steel finish top. They feature a built-in automatic timer which runs for 6 hours on and 18 hours off(3-AAA batteries are included). DO NOT use fire burning candles in the lanterns. Suitable for hanging or free-standing use inside or outside.